Artificial muscles are made from electroactive polymers (EAPs), which are simple, lightweight strips of highly flexible plastic. EAPs can be stimulated to change shape or size through activation mechanisms via chemical, thermal, pneumatic, optical, electric, or magnetic means. EAPs are divided into two major categories based on their activation mechnism: electronic (driven by electric field) and ionic (driven by diffusion of ions) types. Table 1 shows a list of commonly used EAP materials. Electronic EAPs are driven by Coulomb forces and they can be made to hold the induced displacement while activated under a DC voltage. These EAP materials have high mechanical energy density and they can be operated in air with no major constraints. They require a high activation field (>30 MV/m) that can cause uncomfortable electric shocks. The advantages of electronic EAPs are fast reactivity and delivery of strong mechanical forces. They do not need a protective coating and require almost no current to hold a position. Ionic EAPs are driven by the mobility or diffusion of ions and they require two electrodes and an electrolyte for activation. They require as low as 1-2 volts to induce a bending displacement. The disadvantages of using ionic EAP materials are the need to maintain wetness and the difficulties in sustaining constant displacement under activation of a DC voltage. The other major shortcoming is that if the voltage is above a certain level, electrolysis occurs, which causes irreversible damgage to the material. Table 2 gives a summary of the advantages and disadvantages of using electronic and ionic EAP materials. Table 2. Summary of advantages and disadvantages of EAP. The main attractive feature of using EAPs for the development of artificial muscle actuators is their ability to emulate the capability of biological muscles. EAP materials have functional similarities to biological muscles that include quiet operation, damage tolerance, resilience, and large actuation strains (stretching, contracting, or bending). They possess properties that can provide more lifelike aesthetics, vibration and shock dampening, and flexible actuator configurations. EAP materials can be used to fabricate mechanical devices and robots that require no traditional components such as gears and bearings. Currently, there is no definitive explanation on the mechanism of EAP deformation. However, it has been suggested that upon applying an electrical field across a moist EAP strip that is held between metal electrodes induces the bending of EAP. Applying an electrical field causes positive ions to move toward the negative electrode (cathode), while negative ions that are fixed to the polymer experience an attractive force from the positive electrode (anode) (Fig. 1). At the same time, water molecules in the EAP matrix diffuse towards the region of high positive ion concentration to balance the charge distribution. The result is bending of the EAP strip towards the positive anode. Figure 1. Possible deformation mechanism of EAP. EAP materials possess properties that make them very attractive for biomimetic applications. Their properties can be engineered to change various shapes to generate mechanical strength. The flexibility of EAP materials make it possible to make roll actuators that extend or bend when activated by electricity. The spring rolls are made by rolling two layers of dielectric elastomer sheet into compact cylinders. These spring rolls have many applications, such as actuators for robotic and prosthetic mechanims, valves and pumps, and simple linear motion systems. Roll actuators can produce up to 30 N of force, linear displacements of up to 2 cm, and cyclic speeds of more than 50 Hz. Recently, significant progress in the field of EAP in making practical actuators was shown by the group from Yoseph Bar-Cohen. They constructed a miniature robotic arm that was lifted by a rolled dielectric elastomer EAP as a linear actuator and four IPMC-based fingers as a bending actuator (fig. 2). The linear actuator functions in raising and dropping the graphite/epoxy rod, which serves as the robotic arm. Upon stimulating the actuator, the arm exhibits a series of oscillations that need to be dampened for accurate positioning. Sensors and a feedback loop are implemented in the system for control of oscillations. The bending actuator fingers have hooks at the bottom of the strips that function in gripping objects. Figure 2. 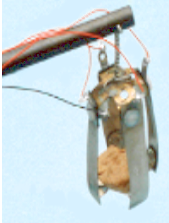 A gripper with four EAP fingers lifting a rock. Another breakthrough that is made in the field of EAP is the development of a fish robot. The fish robot swims without batteries or a motor and it uses EAP materials that bend upon activation. It is powered by inductive coils that are energized from the top and bottom of the fish tank. To intensify the development of EAP materials, an armwrestling competition between EAP robotic arm and human was created. Although the human won the competition, it demonstrated that EAP materials have the capability for use in replacing damaged human muscles. Currently, there is no commercially available electroactive polymers. The following website provides the fabrication procedures for making ionic and electronic EAP materials [http://ndeaa.jpl.nasa.gov/nasa-nde/lommas/eap/EAP-recipe.htm]. EAP is a new field that is highly attractive due to its capability to induce strong displacements and emulate biological muscles. However, the development of EAP materials so far still exhibit low force, slow response, and low conversion efficiency. Currently, there are no robust commercially available EAP materials for consideration in practical applications. In order to be able to transition these materials from a development phase to effective actuators there is a need to establish an infrastructure. There is a need to understand the behavior of EAP materials and the durability under various conditions. There is a need to develop new models that employ computational chemistry and material science to enhance the actuation force of EAP materials. More research is needed to be done to gain a better understanding of the mechanism of electro-activation force and deformation. A movie clip of the current development and applications of EAP. Ashley, S. Artificial Muscles. 2005. Scientific American. Bar-Cohen, Y. Electroactive polymers as artificial muscles- capabilities, potentials and challenges. 2000. Bar-Cohen, Y. Bionic humans using EAP as artificial muscles reality and challenges. 2004. International Journal of Advanced Robotic Systems. 1(3):1-9. Biddiss, E., Chau, T. Electroactive polymeric sensors in hand prostheses: Bending response of an ionic polymer metal composite. 2006. Medical Engineering & Physics. 568-578. Lieber, R.L. Skeletal muscle is a biological example of a linear electroactive actuator. 1999. Proceedings of SPIE's 6th Annual International Symposium on Smart Structures and Materials. Zhang, Q.M., Li, H., Poh, M., Xia, F., Cheng, Z.Y., Xu, H., Huang, C. An all organic composite actuator material with a high dielectric constant. 2002. Letters to Nature. 419:284-287.